Phoenix, AZ’s Jane N’ The Jungle have begun paving their own road in 2017. Their eclectic fusion of 90’s alternative and modern rock has been showcased in a recent string of alt-radio hits. Just this year, we have had the honor of promoting singles like “Killed Someone” and “Faded Stars”. Their new barebones ballad, “One Time”, is the final installment for the year that gives a never-before-seen personal connection to the band. Since their formation in 2013, Jane and her tribe have been putting the work in to separate themselves from the herd. Their debut EP was released just last year, flaunting sounds inspired by the likes of Alanis Morissette, The Cranberries, and Florence And The Machine. Since their debut, the Phoenix New Times named them as one of “17 Metro Phoenix Bands to Watch in 2017.” They have performed on 3TV, AZTV 7, and Fox 10. Their songs “Smoke & Dust” and “Open Road Blues” are currently featured in Honda prime time television commercials. Since planting the seed with such promising promotion, the band has brought their live show to the road to cultivate the Jane N’ The Jungle fanbase. 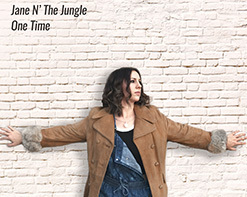 “One Time” is the most personal Jane N’ The Jungle effort to date. The video opens with a shot of Jane hanging out in the neighborhood in her fashion-forward street clothes. It follows Jane as she walks down the street simply singing her story to us without any bells or whistles. Also adding to the stripped mood of the song, the only instrumentation in the whole song is a single acoustic guitar track. At a time in music when everything is digitally layered and produced, the raw nature of “One Time” is a shining light among the millions of independent songs released every day, striking the right chords to truly turn heads and evoke legitimate emotion in just about anyone. We are absolutely ecstatic to be teaming up with such a promising young band like Jane N’ The Jungle to bring you the “One Time” music video and see it included in your regular programming. Don’t hesitate to let us know what we can do on our end to make that happen. Please contact Andy Gesner and the HIP Video Promo team at (732)-613-1779, email us at info@HIPVideoPromo.com. You can also visit www.JaneNTheJungle.com for more info on Jane N’ The Jungle.